Annapurna Circuit Trek 2017 / 2018 is not only the most scenic and preferred treks in Nepal or Himalayas. It is often voted as one of the best long distance treks in the whole world! Whether you want to experience the entire horizon of climate zones right from tropic to Arctic climate zone or explore a rich spectrum of cultures ranging from Hinduism to Tibetan Buddhism, Annapurna Circuit trek is the answer. Almost every type of scenery that Nepal has to offer and for which it is renowned across the world can be experienced in this trekking around the Annapurna region. Annapurna Circuit trek also offers extraordinary views of several stunning peaks including Annapurna, Dhaulagiri,Manaslu, Tukuche and many others. The flora & fauna you can spot on this trek are unmatched. You will find yourself passing through numerous varieties of orchids, Rhododendron forests and can spot over a 100 species of mammals including blue sheep, jackal, mountain Thar or even the elusive snow leopards e.t.c, over 60 species of reptiles and amphibians and over 400 species of birds! Most of Annapurna circuit sits in rain shadow. It means you can trek throughout the year including during the monsoons. Doing the Annapurna circuit trek in monsoons is actually recommended if you want to avoid crowds. However many of the many of the views could be hidden behind the clouds. Most popular season to do the Annapurna circuit trek is from Mid March to End of May and again from October to November. Annapurna circuit trek’s difficulty is moderate to fairly challenging. Previous trekking experience is recommended though not required. Max Altitude 5416m, Average 2800m. Trekking Distance 160 to 230 KM. Tea houses and lodges along the circuit are available for meals and accommodations. You can find a variety of food ranging from Dal Bhat to pizzas all along the route. While accommodation is arranged by your trekking operator, for meals you may have to buy from the tea houses/lodges unless it is also included in your package. As per your arrival schedule, Nepal Planet treks ( Nepal guide info team ) will be at the Airport in Kathmandu waiting for you. We will pick you from there and shift you in a tourist standard hotel overnight accommodation. We start our journey from Kathmandu in the morning. We will drive through the hills and the winding roads along the Trishuli River. We pass through lush green forests and serene and peaceful villages of Nepal that have a great soothing effect on city dwellers with their greenery, rivers, farms and splendid mountain scenaries. Once we reach Besisahar, an half-an-hour drive from there takes us to Khudi, which is basically the point from where we will be starting our long journey around the Annapunra region. Alternatively, we can as well get off at Besisahar,(and it is recommended for those who are prone to motion sickness) and then trek for an hour to get to Khudi along the beautiful trail. From Khudi we can catch a glimpse of the majestic Manaslu range. We trek through the stepped crescent shaped rice terraces, along steep vertical cliffs, lush forests, and some culturally intriguing villages. Marsyangdi River keeps us company throughout the day today, while we walk through gorgeous waterfalls, forests and villages. Trail will be easy and enjoyable until we reach Syange at an Altitude of 1100 m, but starting from Syange the climb gets harder up to Jagat (1300 m). From Jagat, we make a steep climb to Chamje. Overnight at Chamje (1430 m). We will trek through the villages of Manang region for initial few hours, passing through fields of potatoes, barley and corn. Past the villages, we will pass through bamboo forests. We will pass next to a scenic village called Tal that lies on flat sands next to a river which is at the base of a huge waterfall. We rest at Dharapani for the night. We start from Dharapani soon after our breakfast and walk through steep forested ridges witnessing the debris left by several landslides on route on the west. We will be treated to some of the most Iconic peaks of Annapurna region with sensational views of Lamjung Himal, Annapurna II, and Annapurna IV (7,525m/24,688ft). Small hot springs provide an opportunity to relax and add relief on our long day hard trek. Overnight at Chame. First few hours of today’s walk will be through narrow and steep trail and in the midst of thick forest. After a couple of hours of trek we find ourselves facing a huge curved rock, standing over 1500m from the river’s level. The thick forests and heavy vegetation would suddenly disappear. We cross the river multiple times on suspension bridges which is an experience in itself. Shortly after, the opens up and we will be soon surrounded by majestic Himalayan Peaks of the Annapurna region. Upon hikiing through these sites, by evening we will arrive at Pisang. We will stay overnight at Lower Pisang. Soon after starting our trek from Pisang, we will see a fork in the trail and a route goes up and another goes slightly towards downside. We take the upper route here and on continuing upon this route for a while, we feel like we are horizontally walking adjacent to the majestic peaks. The spectacular views of the Annapurna region peaks, Including mount Annapurna, Pisang peak, and several others will definitely be a thrilling experience. We can clearly notice a stark contrast in the landscape and vegetation starting from today. On the way, the cold and dry climate presents tougher conditions than what we have encountered on this trek so far. We will make a quick and short visit to an old Monastery called Barge monastery, which is also the largest in the entire district of Manang. We will stay overnight at Manang. Today is scheduled for acclimatization. While you can relax and take it easy a bit, it is not recommended to rest for the whole day. We will go on a short walk to higher altitude to get acclimatized with the high altitude. Usually it is recommended that you trek to an altitude higher than where your resting place for next day so that you don’t face altitude sickness next day. After this day onwars, the next couple of days are going to be very challenging and tiring trek where we gain altitude rapidly. We should be wary of altitude sickness symptomps. For this day, Bhojo Gompa or Gangapurna Lake is worth visiting from acclimatization as well as scenary persepctive. Further, we can also make an small trip to a nearby village called Vraga where can visit a monastery. This location also has a base of Himalayan Rescue Association where we can get a good idea about Mountain Sickness, its symptomps, precautions and first aid on it. We will star overnight at Manang at the same place where we stayed earlier. From Manang village, the trail crosses a stream, steeply ascends to a village called Tenki, and then continues to climb out of the Marshyangdi Valley turning northwest into the the valley of Jarsang Khola. The trail further passes near the small village of Ghunsa, which is a small cluster of flat mud roofs just below the trail. Now the trail opens upto some beautiful meadows where you can spot horses and yaks grazing in leisure. After crossing a small river on an old but stable wooden bridge, the trail passes an ancient old wall in a pleasant meadow and then reaches another small village of Yak Kharka. Not rushing through your way is the key to avoid altitude sickness. You can do todays trek at a relaxed pace. Finally we stay for the night at Yak Karka. Our goal for today is to trek till the hamlet which is foot of the mountain pass, Throng Phedi. Annapurna circuit Trekkers like us use this hamlet as a base camp. We stay for the night at Thorong Phedi. Next day is going to be a challenging trek. We reach the highest point and the most remarkable location of our entire Annapurna round trek today. An early morning start is required to achieve our days objective. We need to keep motivating and pushing ourselves and continue working hard in negotiating the icy high-altitude trail. However, your eyes and senses will relish at the outstanding high Himalayan scenes over the horizon while our legs and heart work extra hard to keep us going on the trail. By sun set, we should be reaching Muktinath which is a popular pilgrimage site for Hindus and Buddhist. Muktinath contains a temple of Hindu god – lord Vishnu and a Monastery. It stands as a testimony to the great cultural diversity and religious harmony of Nepal. We will sleep at Muktinath tonight. Today we will start our descend down the scenic Kali Gandaki valley. For the first few hours we trek through cold and dry terrain which is basically an extension of the Tibetan plateau and has same climatic conditions and culture as well. We will trek through Jharkot and Khingar villages which have typical Tibetan culture and architecture and we follow the KaliGandaki valley floor for most of the way till Jomsom. All the path, we sight gorgeous views of both Dhaulagiri and Nilgiri ranges. Jomsom is a large town which has an airport that is well connected to Pokhara. It is spread across both the banks of Kali Gandaki river. In this town, we spend the final night of our trek. Overnight stay at guesthouse in Jomsom. We will have an early breakfast and take a morning flight from Jomsom to Pokhara. It could as well be one of the most scenic flighs you would ever take anywhere in the world. You will fly over the Kali Gandaki Gorge and will get beautiful views of the Dhaulagiri, Nilgiri Annapurna ranges. Upon reaching pokhara, you will take a tourist bus that will drive back to Kathmandu or if you wish, we can arrange a private car or flight tickets for your Pokhara to Kathmandu journey at additional cost. Tonight we will stay at a nice hotel in Kathmandu. After your breakfast you can check out from the hotel and our representatives from Nepal Planet Treks will drop you to Tribhuvan International Airport (TIA). We bid our final goodbyes for this trip and we hope to see you soon on your next adventure in Nepal. 1. What is the best time to go on Annapurna circuit trek? Annapurna circuit is open for trekking all-round the year. However, there are two prominent seasons regarded as best to trek. Please note that these two periods carry high toll of trekkers around Annapurna circuit. October to November: Post Monsoon is regarded as the best season to go trekking around Annapurna region. Very fact that the atmosphere is flushed clean by heavy monsoon rains, makes the Annapurna region breathtakingly beautiful and mountains full of life. Temperature is also ideal as it neither very cold nor hot. Please note, temperature usually drops below freezing point after sunset. Also, the trails are safe to trek as slopes are not moist and slippery from monsoon rains. Mid-March to May: Pre Monsoon is regarded as the second best season to do Annapurna Circuit Trek. For those who don’t like cold temperature, this is the best time to trek, as temperature is warm and humid. Please note, trekking at low altitudes can be unpleasant as trekkers tend to seat a lot. Trails are free of snow and sky is also usually clear. Allowing trekkers to enjoy the breathtaking view of Annapurna range. 2. How many days does Annapurna round trek generally last? If you wish to go about Annapurna Circuit trek through a tour agent, duration depends upon the itinerary each one has prepared. Generally, on a broad scale, Annapurna circuit trek can last somewhere between 15 to 23 days. Duration also depends on your walking pace. If you are very slow at walking, trek will take longer to finish. There are also many sightseeing’s along the trek. Which, if you wish to take, can again increase the duration of the trek. 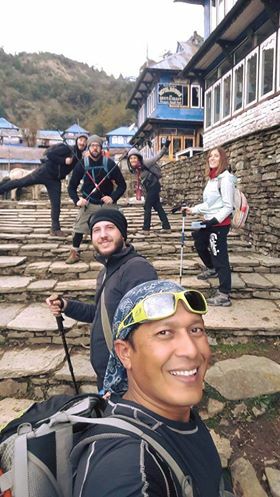 If you wish to do Annapurna circuit trek on your own, that is, by hiring your own guides and booking accommodations on your own, you are fee of time factor. You can take you own time to do Annapurna circuit trek. 3. What is the fitness level that Annapurna circuit trek demands? 4. What are the kinds of accommodation available during the course of Annapurna Round trek? One need not worry about accommodation, as it’s easily available during Annapurna circuit trek. There are Guest Houses or Tea Houses all along the way which also serve food. These Guest house charge about 100NPR per night per person. And, if you are booking Annapurna Circuit trek through a travel agent, then accommodation is most likely to be taken care by them. Most of the guest houses or Tea houses charge extra for hot water at higher elevation. And, most times its lukewarm water that you get for this extra price. Therefore kindly keep that in mind. Also charging electronic devises gets difficult as you go higher in altitude. Guest Houses charge extra for charging your electronics. I would recommend pre booking of accommodation if you choose to trek without a tour agent. Booking accommodation in Katmandu would work best. 5. What is the difficulty level for Annapurna Round trek? Annapurna Circuit Trek is graded as a moderate level trek. A moderate graded trek does not demand previous hiking or trekking experience. However, being physical fit (normal fitness) and being healthy will surely make it easy for you to trek. At this grading, Trekkers will need to walk for 5-6 hours a day. During Annapurna Circuit trek’s duration, trekkers will be walking for an average of 5 hours each day. Therefore, it’s best for trekkers to physically prepare themselves before they take on this journey. What trekkers must be more worried about is the altitude. Annapurna Circuit trek starts at around 2000ft above sea level and rises all the way to 17769ft above sea level. As trekkers go higher in altitude, air in the atmosphere becomes thin and oxygen content decreases. Making it difficult for trekkers to breathe. And, altitude sickness makes it more difficult. Therefore, acclimatization would be the best way to counter altitude sickness. 6. Would any medical condition restrict a person from doing Annapurna Circuit trek?